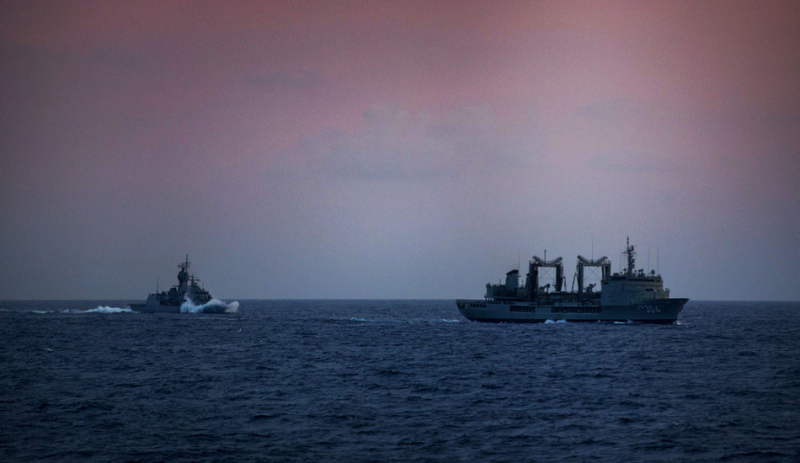 HMAS Toowoomba sails in company with HMAS Success during their South East Asia Deployment. Image via Commonwealth of Australia, Department of Defence. Royal Australian Navy Frigate HMAS Toowoomba has wrapped up a logistic resupply mission with the Royal Brunei Navy and government officials. Chief of Joint Operations, Vice Admiral David Johnston, said Toowoomba’s deployment provided an opportunity to further strengthen a military to military relationship with the Royal Brunei Armed Forces. "Toowoomba’s visit to Brunei included an official function with local dignitaries and members of the Armed Forces, and a roundtable discussion on maritime security," VADM Johnston said. At the Anzac Day dawn service, personnel from HMAS Toowoomba provided a catafalque party and the ship’s company lined the beach which was the site of HMAS Kanimbla landings on 10 June 1945. VADM Johnston said it was an honour to commemorate the Australian military personnel who fought in Brunei during World War II. "Our continued presence in south-east Asia demonstrates our commitment to regional security and partnerships and builds on the contributions made by our predecessors," he said. HMAS Toowoomba will join Exercise Bersama Shield, a multilateral activity with the Five Power Defence Arrangement nations, in the coming weeks. HMA Ships Anzac, Toowoomba and Success are conducting a deployment to south-east Asia and will participate in a series of exercises with nations in the region.